Chelsea coach Marco Ianni has been charged with improper conduct following his bust-up with Jose Mourinho. Manchester United boss Mourinho has also been “formally reminded of his responsibilities” after the touchline row at Stamford Bridge on Saturday. That will come as a relief for Mourinho but the FA have effectively made it clear they were not happy with the Portuguese’s part in the bust-up which was reported by referee Mike Dean. Sarri was quick to apologise for Ianni’s behaviour after the Chelsea coach ran past Mourinho and celebrated in front of the United bench following Ross Barkley’s 96th minute equaliser. Ianni has until Thursday at 6pm to respond while Chelsea have also pledged an internal investigation. The FA have now issued a statement which read: “Chelsea coach Marco Ianni has been charged following the game against Manchester United on Saturday [20 October 2018]. “It is alleged that his behaviour in the 96 minute constituted improper conduct. He has until 6pm on Thursday 25 October 2018 to respond to the charge. 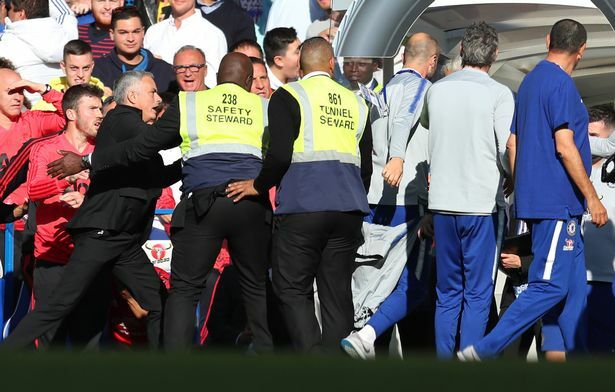 Mourinho revealed on Monday that Ianni and Chelsea apologised for the incident in the immediate aftermath and stated that he didn’t believe the Italian should be sacked, despite calls from elsewhere. Speaking ahead of United’s Champions League clash with Juventus, Mourinho said: “He apologised to me, I accept his apologies, I think he deserves a second chance. “I don’t think he deserves or to be sacked, than the fact his club was strong with him and he went through a situation he recognises he was wrong.